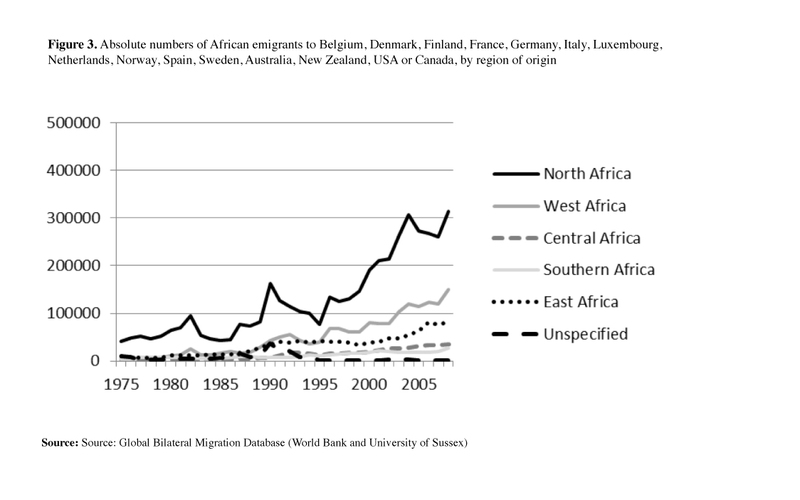 African migration is often perceived as massive and increasing, mainly directed toward Europe, and driven by poverty and violence (Lessault and Beauchemin 2009). However, these assumptions are not based on empirical evidence. 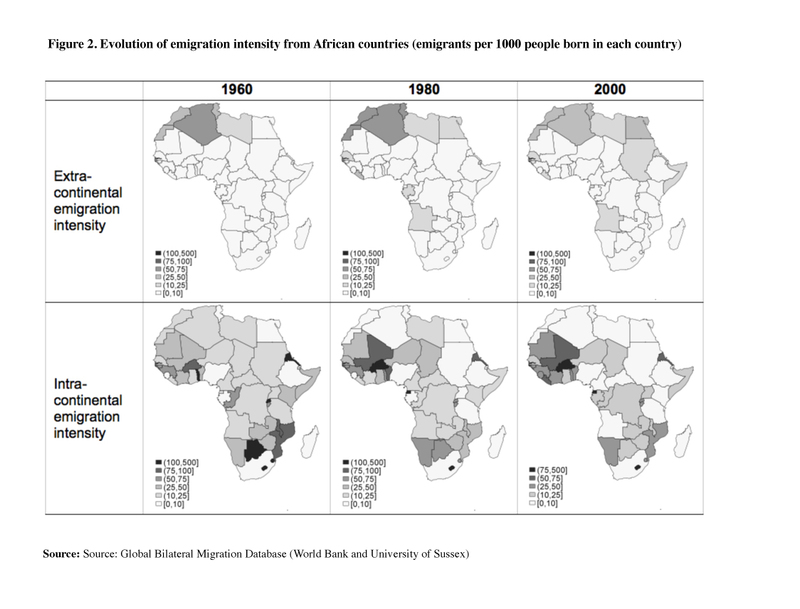 We now have a much better ability to assess the volume and geographical orientation of African emigration, thanks to the Global Bilateral Migration Database (GBMD) on the presence of emigrants abroad (migration stocks; World Bank and University of Sussex ).¹ African migration is first and foremost intra-continental. In 2000, 75 percent of all African migrants lived in another African country, while 16 percent were in Europe, 5 percent in America, 4 percent in Oceania and 0.3 per cent in Asia. In fact, African extra-continental emigrant rates seem to be the lowest of all world regions. Data on the presence of emigrants abroad (migration stocks) at different periods also provide a global and long-term perspective on how this migration evolves. In 2000, on average, 2.3 per cent of African-born people were officially living abroad, down from 2.8 per cent in 1960. As Figure 1 shows, intra- and extra-continental migration have nevertheless evolved in different ways. 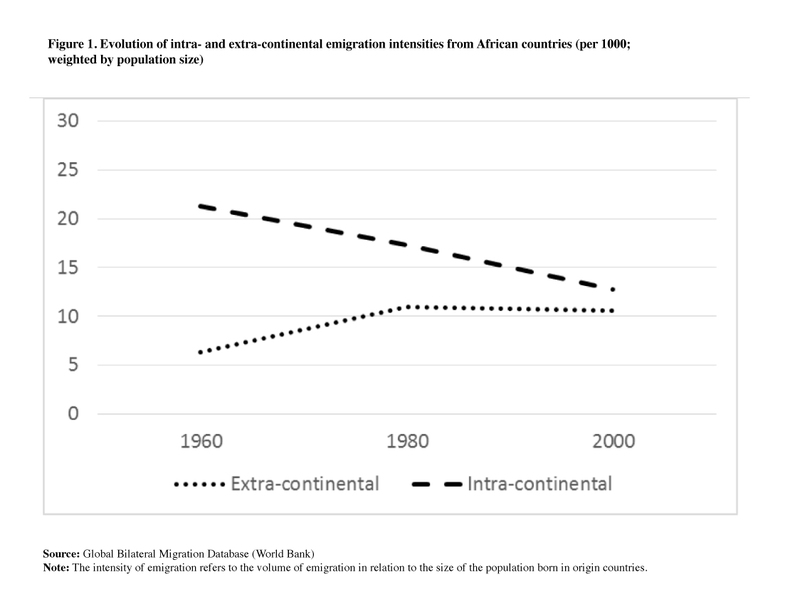 While extra-continental emigration, albeit low, has increased, particularly between 1960 and 1980, intra-African emigration has been higher, but with a clearly declining trend between 1960 and 2000. This declining trend may be related to processes of post-colonial state formation and the related imposition of barriers against free movement in the wake of decolonisation. It could also be linked to the rise of nationalism and related inter-state and intra-state tensions and violence. Because of common intra-African visa restrictions, African citizens often face considerable obstacles to moving within the continent (Flahaux and de Haas 2016). Maps of intra-continental migration reveal that most emigration from the poorest and landlocked African countries is dominated by relatively short-distance migration to nearby countries (Figure 2). Figure 2 also shows several patterns of extra-continental migration. First, the intensity of emigration is highest from Maghreb countries to non-African countries. This is related to their geographical proximity to Europe, their strong colonial and post-colonial links to France, and the labour recruitment agreements they have signed with European countries since the 1960s. By contrast, the emigration intensity from sub-Saharan countries to non-African countries is very weak. Yet in recent decades some countries have developed stronger extra-continental connections (such as Angola, Gabon, Liberia, Senegal, Sudan, Eritrea and Somalia). Some of these cases seem to be related to conflicts and long-distance networks created as a consequence of refugee resettlement and colonial ties. More generally, countries with large numbers of emigrants to extra-continental destinations are those with higher levels of human and economic development. This can partly be explained by the fact that people need aspirations but also resources (capabilities) in order to migrate (de Haas 2011). Development processes increase people’s access to material resources, social networks, education, media and knowledge. Improvements in infrastructure and transportation, which usually accompany development, facilitate travel and migration over growing distances. 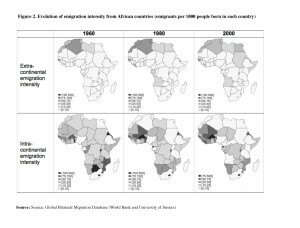 In addition to the data on stocks from the Global Bilateral Migration Database, flow data from the DEMIG project can be used to study the recent evolution of African migrants’ arrivals (migration flows) in several major countries in Europe, North America and Oceania. The flow data depicted in Figure 3 confirm the trends observed using the stock data. 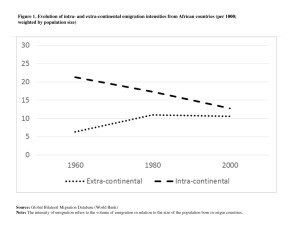 The figure shows that North Africa still dominates extra-continental emigration, but migration out of Africa is increasing from other sub-regions, particularly from West Africa. The predominant role of these two sub-regions can be explained in part by their close connections with Europe and by the historical role of labour recruitment in Francophone countries in the Maghreb as well as in Senegal and Mali. But it is also linked to the fact that West African countries (particularly coastal ones) are more integrated into international systems and tend to have slightly higher levels of human development. 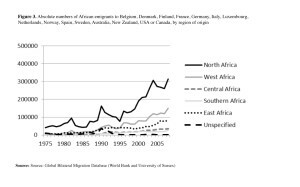 Contradicting the popular notion of a ‘continent on the move’, African migration is relatively modest in scope and geographical reach; African migrants overwhelmingly migrate within Africa. While emigration from the poorest countries is predominantly directed towards neighbouring countries, the intensity of emigration out of Africa is increasing, particularly from countries with relatively higher levels of human and economic development. 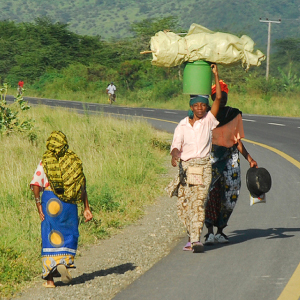 Higher income, education and access to information all increase people’s capabilities and aspirations to migrate. This trend is likely to continue in the future. At least part of this emigration is likely to be directed at Europe, although this is typically dependent on labour opportunities and growth in this region. Restrictive policies aiming at reducing immigration in Europe are unlikely to be effective in countering these structural trends. de Haas, Hein (2011). The Determinants of International Migration, DEMIG Working Paper 2. Oxford: University of Oxford: International Migration Institute. Lessault, David and Cris Beauchemin (2009). “Ni invasion, ni exode. Regards statistiques sur les migrations d’Afrique subsaharienne”, Revue européenne des migrations internationales, Nouvelles migrations chinoises en Afrique et en Amérique latine, 25 (1), 163-194. The global matrices of bilateral migrant stocks of the GBMD span the period 1960-2000. Census and population register records were combined to construct decennial matrices corresponding to the last five completed census rounds. However, comparable data for the subsequent period are not available. * The research leading to these results is part of the DEMIG (Determinants of International Migration) project and has received funding from the European Research Council under the European Community’s Seventh Framework Programme (FP7/2007-2013)/ERC Grant Agreement 240940. The authors received the Rinus Penninx Best Paper Award for this paper at the 11th Annual IMISCOE Conference, held in Madrid on 27–29 August 2014.